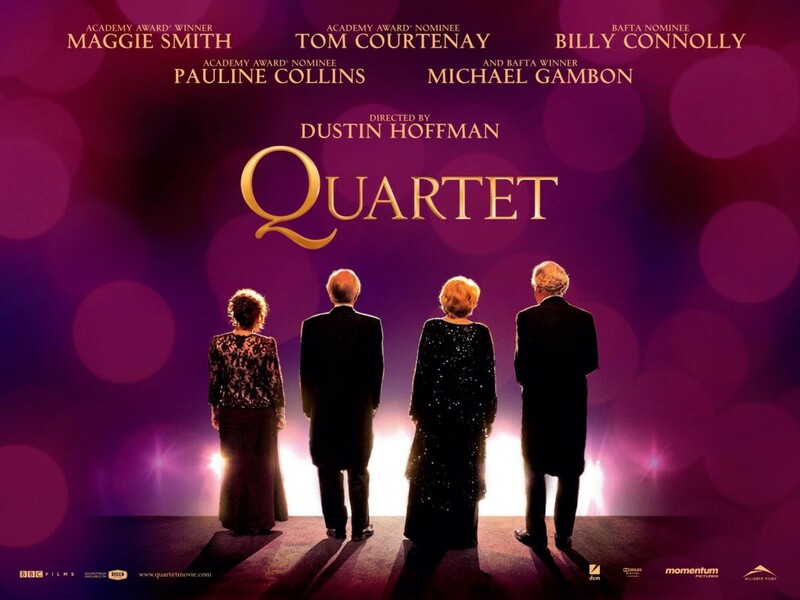 Quartet is top shelf, feel-good British filmmaking that will delight fans of Downton Abbey, Best Exotic Marigold Hotel, and winner of the 2011 Best Picture Oscar, The King’s Speech. 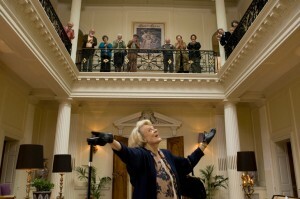 Indeed, like the aforementioned films, the audience will laugh, cry and leave the cinema in a magical mood. The beautiful Beecham House is a grand mansion that is now a home for retired musicians.A new arrival is about to threaten the annual concert to celebrate composer Verdi’s birthday; this disruption causes the residents anguish and despair, especially one particular fellow, Reginald (Tom Courtenay). No interest in small talk, the lady causing the dilemma is none other than Jean (Maggie Smith in regular fine form) a prima donna who was once romantically involved with Reginald. Jean, a magnificent former soprano herself, refuses to sing in the performance to complete the final piece of a quartet puzzle, which would be for a reunion of the famous opera Rigoletto. However, the show must go on. The musical numbers, be it a capella or assisted by instruments is a simple pleasure. There are smiles all round with this exuberant cast clearly having a ball. A regular visit between the aged and a high school class is a delight as rap meets opera, then mashed-up, much to the delight of both students and teacher. Unexpected complete entertainment. Directed by none other than Dustin Hoffman (yes, that Dustin Hoffman), he has crafted a buoyant story full of hope, romance, drama and eerie reality that is upheld by a fantastic sense of humor. Assembling the performers, many of them real life old school musical stars of the stage is a wonderful journey of emotions. Scotsman Billy Connolly is a stupendous riot as the flirty Wilf, while Michael Gambon (Dumbledore in Harry Potter) is a camp classic as former conductor Cedric with a penchant for airy fairy caftans. Pauline Collins (Shirley Valentine) puts in an understated performance as Cissi, an eternally kind resident in the early stages of dementia. Of great importance is the setting. The green surroundings, leafy countryside forests with creeks trickling of water and the manicured gardens around the mansion are postcard impeccable. The glorious cinematography is enhanced by the isolated English locations. There’s some really nice scenes between various cast members, and it is obvious they are all true to life good friends; their performances seem effortless but ever so effective. Quartet hits select theaters on December 28th.